This is a great recipe for homemade teriyaki sauce- it’s delicious on these kabobs but you could use it on any kind of meat stir fry as well. I love grilling fruits it adds a nice sweetness to the rest of the dish. Keep this recipe on hand for your next barbecue (Labor Day is just around the corner)! 1. Place the marinade ingredients in a small saucepan over medium heat and stir until combined. Then allow it to cool. 2. Place the meat in a ziplock bag or a resealable container with about 3/4 of the marinade. Save 1/4 of the marinade for later. 3. Cover the meat and marinate in the refrigerator for 6-24 hours. 4. After it is marinated, preheat your grill to medium-high. 5. Skewer the meat, pineapple, peppers and onions and place on the grill. Spoon some of the extra marinade over the skewers. 6. 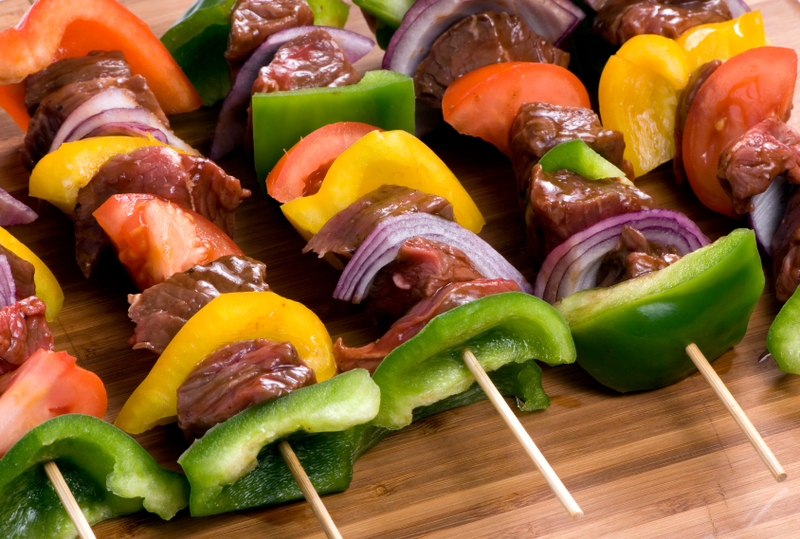 Turn the skewers as needed, until the meat is cooked to your liking and the vegetables are tender. 7. Remove from grill, serve and enjoy!